To the website of Ricky Tree, where you can gain information about our company and learn about healthy and some not so healthy choices for your trees. After attending Humber College in Toronto I completed my apprenticeship and certification to become a Certified Arborist of Ontario in 2003. Ricky Tree strives to provide 100% customer satisfaction by applying the years of experience and knowledge gained in the field of arboriculture. Trees are amazing living structures that appreciate with age and are the most valuable component in your landscape, bar none. Improper pruning or trimming is irreversible and could lead to permanent damage and/or a disfigured tree lessening their value and appeal. An Arborist can assist you in the proper way to plant, care for, and maintain your trees ensuring their health and structure. Topping also called heading, tipping, hat racking and rounding over is not a proper method to reduce height or hazard. Topping stresses trees making them more vulnerable to insect and disease infestations. Topping causes decay because the cut has been made improperly and is entirely too severe to heal over. Topping can cause sunburn, which can lead to cankers, bark splitting and death of some branches. Topping creates hazards by the new growth being below topping cut and more prone to ripping off under load. Topping is improper therefore the owner maybe liable in a court of law for any damages. Topping makes unsightly ugly trees, which will never regain their natural form and depreciate the landscape value and become a liability. Topping is expensive. When topped, limbs then grow faster (some instances 25 feet per year) thus needing to repeat this massive trimming every couple of years. Also because of the growth being so dramatic, the danger of climbing and removing these branches increases (depending on location) and can lead to a expensive trimming or removal cost. Eliminating branches that rub, interfere, or obstruct objects or view. 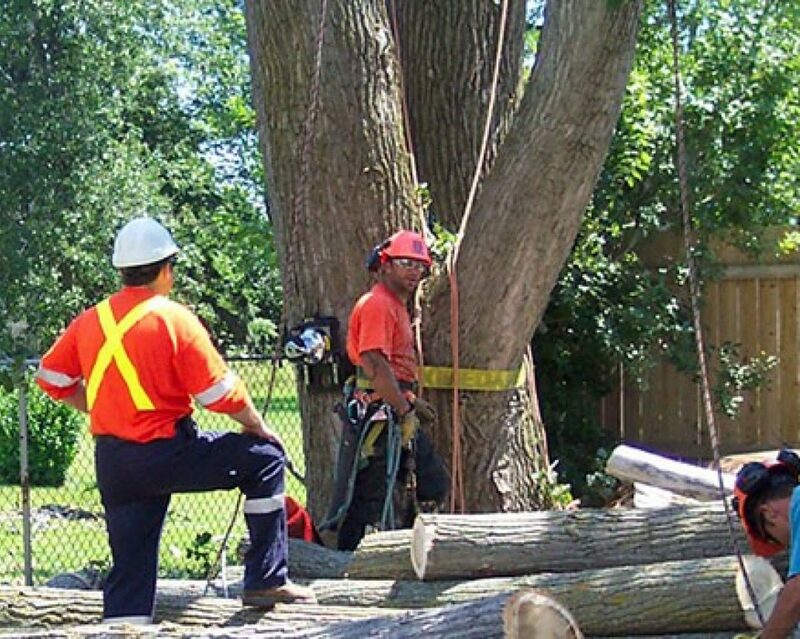 Removing dead or weak limbs that may pose a hazard. Removing diseased or insect infected limbs is also very important. While every tree has the potential to fall, only a small number actually hit something or someone. It is the owner’s responsibility to provide for the safety of trees on his/her property. Cabling is installed to add support to the canopy of the tree. Bracing assists in the support of the trunk or limbs when a split, seam or included bark is present. Trees that are dead, dying, hazardous, or planted in a poor area should be removed. The planting of trees and shrubs is performed using up to date arboriculture guidelines and standards. This details the removal of leaves and branches. Mulching around trees and or shrubs could also be performed. Because plants in the landscape are rooted in one location their health depends on their surroundings. Fertilizing is performed using a liquid that is injected under pressure into the root system surrounding the entire tree. The liquid solution can also be applied by a foliar spray feeding. There is a spring and fall application that results in a safe, non-burning steady feed. A 100% natural organic soil amendment and root stimulator or 100% natural bio stimulant and soil amendment is also available. Please ask for details. Tree trimming and removal can be very dangerous! The following procedures displayed within this website are for viewing only and not for educational purposes. Please do not attempt any of these at anytime.